With all the zillions of great recipe apps out there, tablets make great cookbooks; but if you’ve ever tried to chop up tomatoes on one, you know they don’t make great cutting boards. Despite the wealth of helpful information they can provide, our fancy tech toys just aren’t well-suited for use in the kitchen – but Sharp hopes to change all that with a new high-tech cutting board. Designed by Siobhan Andrews, Chop-Syc is the winning entry in Sharp’s #GetItDownOnPaper product design competition. The device is basically just a gigantic, scratch-proof tablet that you can use your knives on, but it’s also got a few key features that give it extra functionality. Intended to simplify healthy cooking, Chop Syc uses a built-in scale and proprietary software application to make portion control easier. Using the touchscreen, you start by selecting a recipe from the board’s application. This can be a recipe that you’ve built and saved yourself, or one that you’ve found online somewhere. Once you find something that suits your fancy, you simply designate the number of people you’re cooking for and Chop-Syc will automatically adjust the portions to fit the size of your group. As you chop up each ingredient, the device’s built in scale tracks how much you’ve prepared and lets you know when to stop. Ideally, this will help you from going overboard and making too much food, thereby keeping you healthy and reducing food waste. It’s still a prototype at this point, and its design is still evolving, but one specific feature that Sharp mentions in the video below is a handy pasta measurement tool that helps ensure you don’t make more noodles than you have sauce for. Just enter in how many people are eating and the screen will bring up a circle to shows how much dry pasta, when held upright, is needed for the meal. And of course, if you’re not doing anything technical and just want to use Chop-Syc as a cutting surface, its digital features can be disabled, and the device will display a wood-grain wallpaper as your chopping surface. Given the fact that Sharp named it the winner of the recent #GetItDownOnPaper design competition, Chop-Syc may very well become a real, live product in the near future, but at this point in time we haven’t the slightest idea when it will be available or how much it will cost. Given the technical nature of the product, we’re guessing it’ll probably cost a pretty penny if it ever hits the market. What do you think? 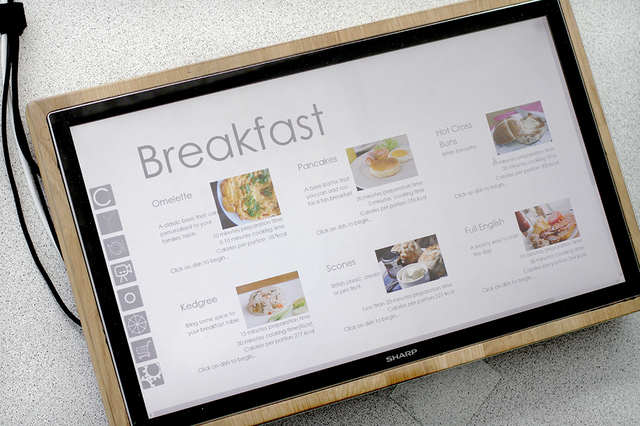 Would you buy a touchscreen cutting board, or is this another example of an overzealous tech company pushing forward an impractical product?